Spot power prices opened at a premium this morning as temperatures were revised down again. The UK's Torness Nuclear Power Station goes offline for maintenance later this week and is due to remain offline until September - this will likely offer support to power contracts. NBP spot prices made gains yesterday as demand remained high, meaning Linepack forecasted 3mcm yesterday afternoon. Wind generation was poor yesterday meaning that increased demand put pressure on gas fired power generation. The arrival of the Al Sheehaniya LNG tanker remains scheduled for arrival at South Hook today. The UK gas curve was weighed down on Monday by the lower Brent Crude price in addition to the devaluation of the Euro against the Pound. News of another LNG delivery to South Hook on the 20th July pushed Front-Month contracts down. Prompt contracts continued to make gains yesterday as demand remained above average. The UK power curve mirrored its gas counterpart yesterday, with prices being weighed down by uncertainty over the EU's bailout agreement with Greece. Losses were restricted further out on the curve, as the Greek deal offered support to carbon prices. Near curve contracts managed to maintain some support from significantly reduced wind power output which was 2GW lower than Sunday. Day-Ahead gas prices opened at a premium this morning, whilst the remainder of the curve shed value, with Summer-17 dropping 0.85ppt. The UK system remains short today with LNG withdrawals remaining steady. 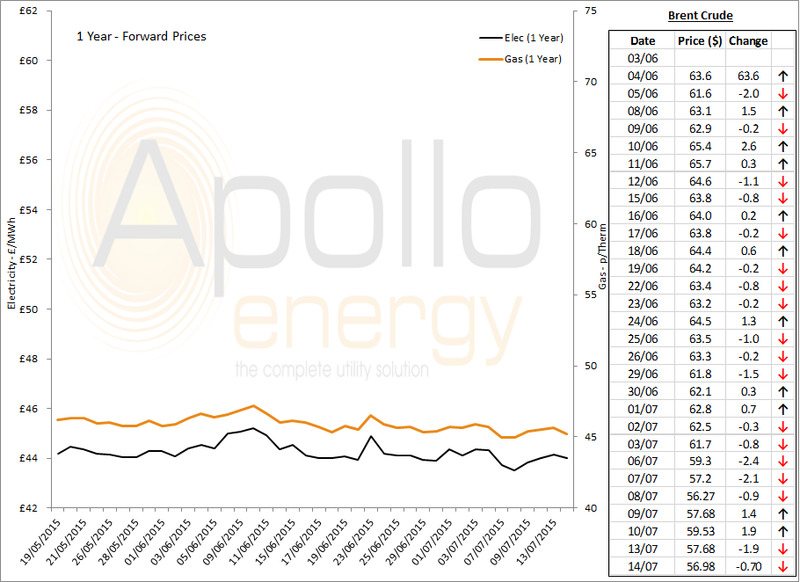 The UK power curve followed a similar trend to the gas curve this morning, with losses being recorded further out but gains on the near curve - Day-Ahead added £1.15/MWh to its value. This support comes from the downward revision of European temperatures. Market close data has revealed that the 1-year forward price for both commercial gas and commercial electricity has decreased slightly - closing at 45.20ppt and £44.00/MWh, respectively. This can be seen in the graph below. Brent Crude fell more than a dollar again this morning in light of the nuclear deal made with Iran which may relax sanctions against Tehran.